When Atalanta, the popular tart plum saison created by Orpheus Brewing on the eastern edge of Midtown, first went into cans in early 2014, it earned itself a footnote in Georgian brewing history as the state’s first packaged, commercially available sour beer. Though it seems like a lifetime in the hyper-evolving landscape of local craft brewing, that milestone was just over a year ago. 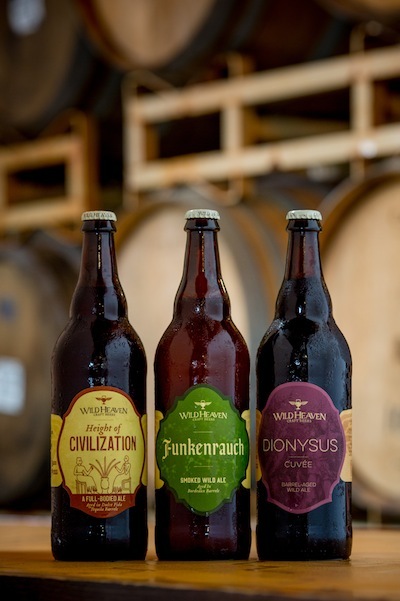 At the time, the only other Atlanta-area brewery producing tart beer of any kind was the Wrecking Bar Brewpub, and those releases were draft-only (not including sours from Creature Comforts Brewery in Athens). In a city where many of the small breweries were still taking shaky first steps, “tart” was a notably absent dimension of flavor. But in 2015, much has changed. A new wave of Atlanta-produced sours have arrived. Produced by breweries with vastly differing aesthetics and brewing philosophies, the timing of the releases, coupled with the new Georgia beer laws that went into effect on July 1, have essentially made this “the summer of Atlanta sours.” The names speak for themselves: Orpheus, Wrecking Bar, Wild Heaven Craft Beers, Monday Night Brewing, Three Taverns, and Blue Tarp have all released new tart beers in the last month. Even the venerable SweetWater, which has never produced a true sour, is apparently planning an as-yet-unrevealed tart beer for the fall, according to “minister of propaganda” Steve Farace. It’s important to note that the term “sour” itself is ultimately just a blanket description for many styles of tart beer. The sours produced in the last month are a testament to how varied a descriptor this can be, incorporating a full range of completely different techniques, ingredients and final products. Some are light, zesty, refreshing summer quenchers. Others are rich, heady fruit beers filled with juicy fruit flavors and residual sugar. Still others are dry, complex and boast intense tartness. Some of those beers are so-called “kettle sours,” a nontraditional method where souring bacteria is allowed to infect and sour the beer before it’s ever boiled and introduced to more common brewer’s yeast. Such a method can be very helpful to breweries with limited means hoping to produce certain sour styles, given that it can greatly reduce the time needed to make a tart beer. Other breweries have done things the long, slow way, as Three Taverns has done in the build-up to the limited release of their first-ever sour, Inceptus, a saison base aged in Georgian wine barrels for more than a year and inoculated with wild yeast culture from good o’le Decatur air. Atlanta’s menagerie of brewers have each followed with their own twist on this formula. At Blue Tarp, a collection of ultra-limited sours were released to celebrate the July 1 beer law reform, including an apricot sour, a “cucumber honeydew sour,” several sour stouts, and a beer enticingly called “Cherries Jubilee.” At Wild Heaven, on the other hand, three sours have likewise been released in the past few months—first the wild yeast-infused Swan Swan Hummingbird and then both a sour rauchbier (smoked beer) and Dionysus, a cuvee featuring a blend of six different sours, primarily a sour version of their Belgian quad, Eschaton. Monday Night Brewing, meanwhile, employed a truly unusual method in creating their first sour released last month, Spirit Animal. The beer was kettle soured not with an already-cultivated strain of bacteria intended for brewing but by literally dumping Indian yogurt into the kettle. According to Jonathan Baker, the brewery’s head of marketing, the dozen different strains of lactobacillus simply took over from there. Baker may be more right than he knows, according to Orpheus brewmaster Jason Pellett. Ultimately, the proof of sour beer’s ascendency is where those beers are being consumed, and in the case of Orpheus products, suburban restaurants, not beer geek-focused bars, are taking down a majority of the draft kegs.